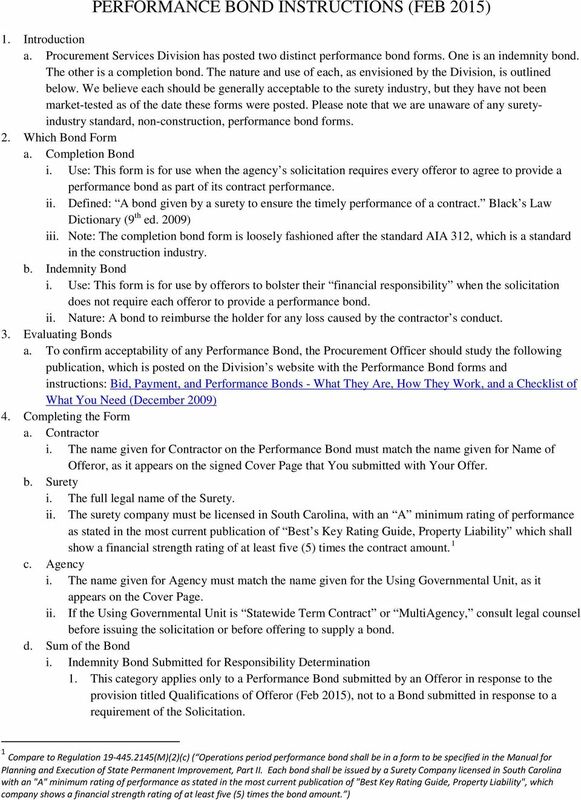 Download "PERFORMANCE BOND INSTRUCTIONS (FEB 2015)"
2 2. Offeror s proposal should state its offer to provide a Performance Bond upon award and should also state the sum of the bond being offered. In determining responsibility, the Procurement Officer may consider the Sum of the Bond in determining responsibility. For maximum benefit, the Sum of the Bond, or Penal Sum, should equal the total contract price (i.e., the potential value) of the contract. 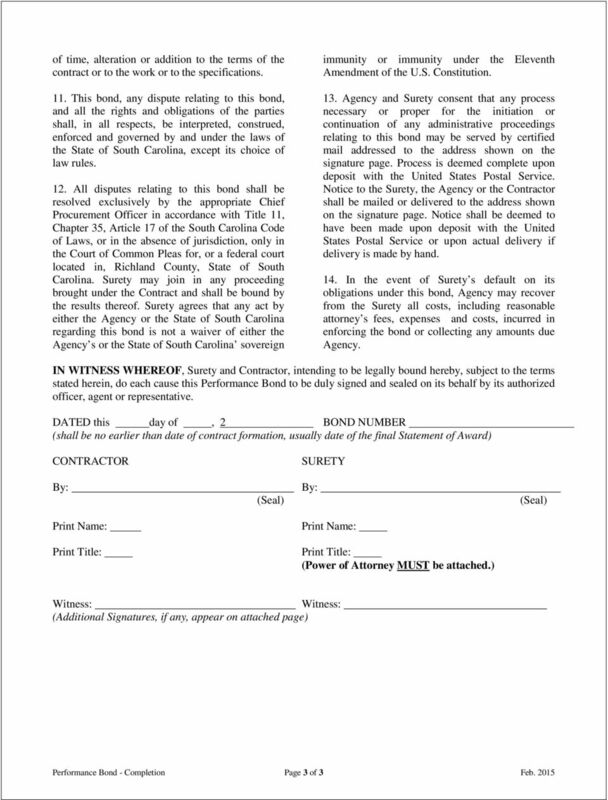 The Procurement Officer should refuse any surety not licensed to operate in South Carolina. 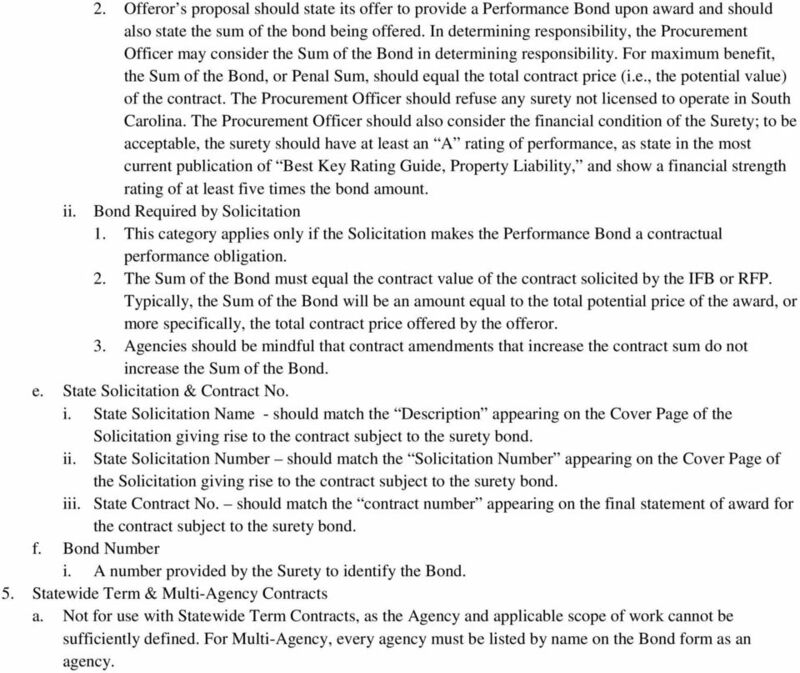 The Procurement Officer should also consider the financial condition of the Surety; to be acceptable, the surety should have at least an A rating of performance, as state in the most current publication of Best Key Rating Guide, Property Liability, and show a financial strength rating of at least five times the bond amount. ii. Bond Required by Solicitation 1. This category applies only if the Solicitation makes the Performance Bond a contractual performance obligation. 2. The Sum of the Bond must equal the contract value of the contract solicited by the IFB or RFP. Typically, the Sum of the Bond will be an amount equal to the total potential price of the award, or more specifically, the total contract price offered by the offeror. 3. Agencies should be mindful that contract amendments that increase the contract sum do not increase the Sum of the Bond. 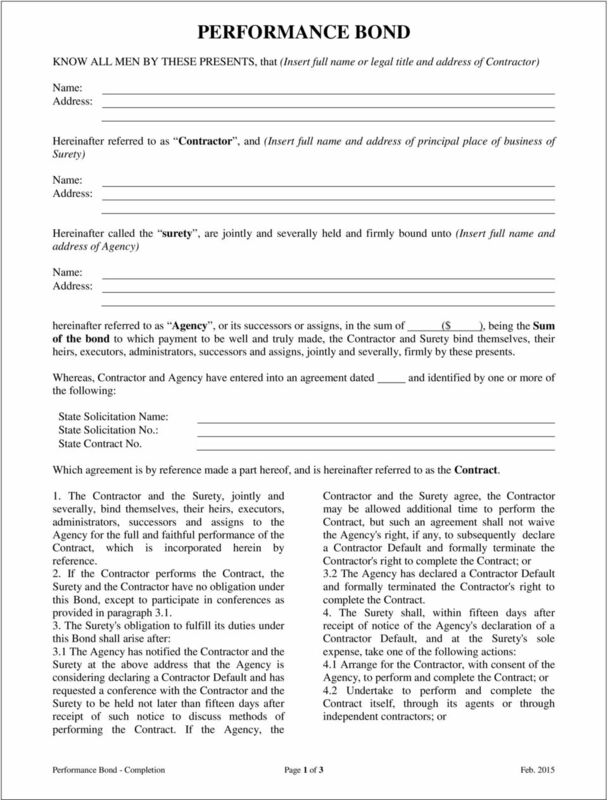 e. State Solicitation & Contract No. i. 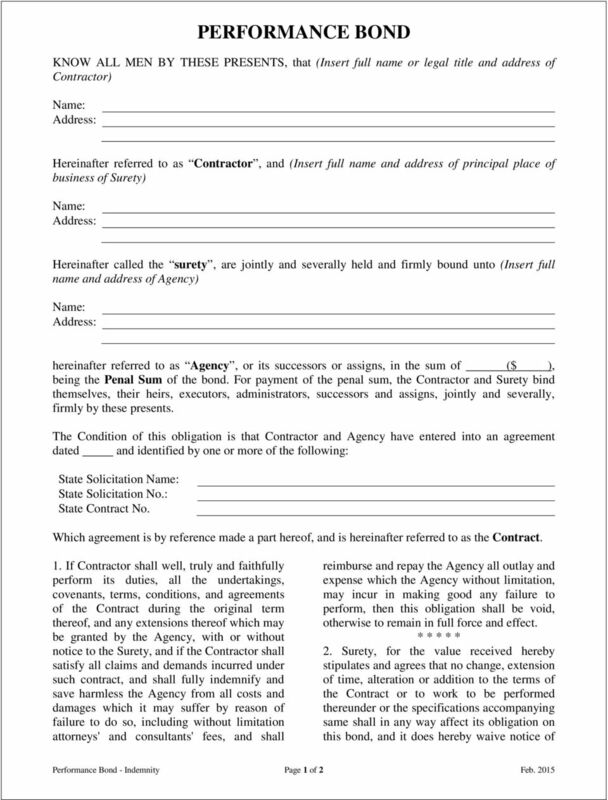 State Solicitation Name - should match the Description appearing on the Cover Page of the Solicitation giving rise to the contract subject to the surety bond. ii. State Solicitation Number should match the Solicitation Number appearing on the Cover Page of the Solicitation giving rise to the contract subject to the surety bond. iii. 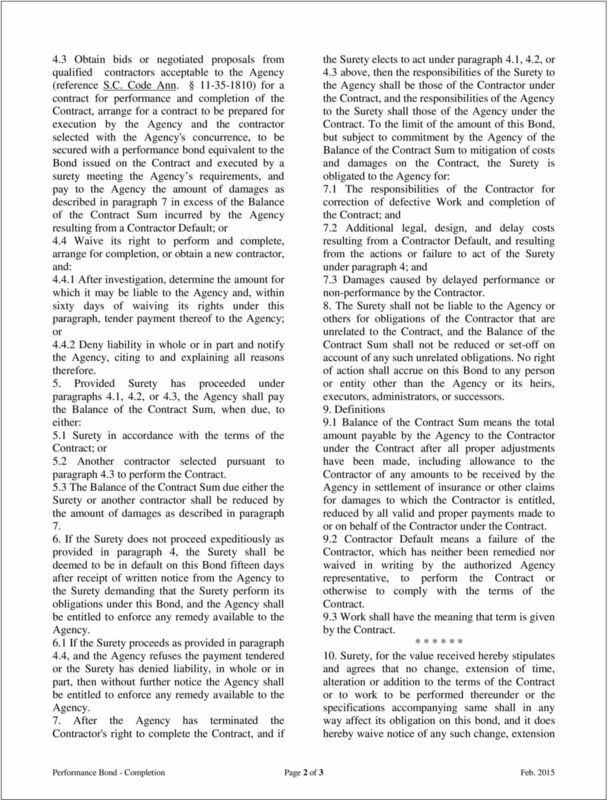 State Contract No. 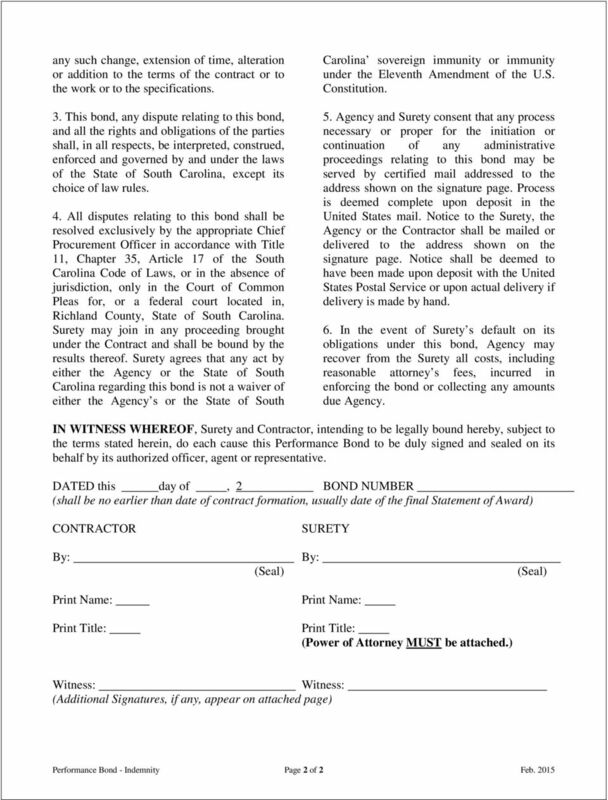 should match the contract number appearing on the final statement of award for the contract subject to the surety bond. f. Bond Number i. A number provided by the Surety to identify the Bond. 5. Statewide Term & Multi-Agency Contracts a. Not for use with Statewide Term Contracts, as the Agency and applicable scope of work cannot be sufficiently defined. For Multi-Agency, every agency must be listed by name on the Bond form as an agency.